Calling girls ages 8 and up! Join the Girls Club. Come to the mosque to mingle with girls your age, grow new friendships, learn, and attach your hearts to the mosque. 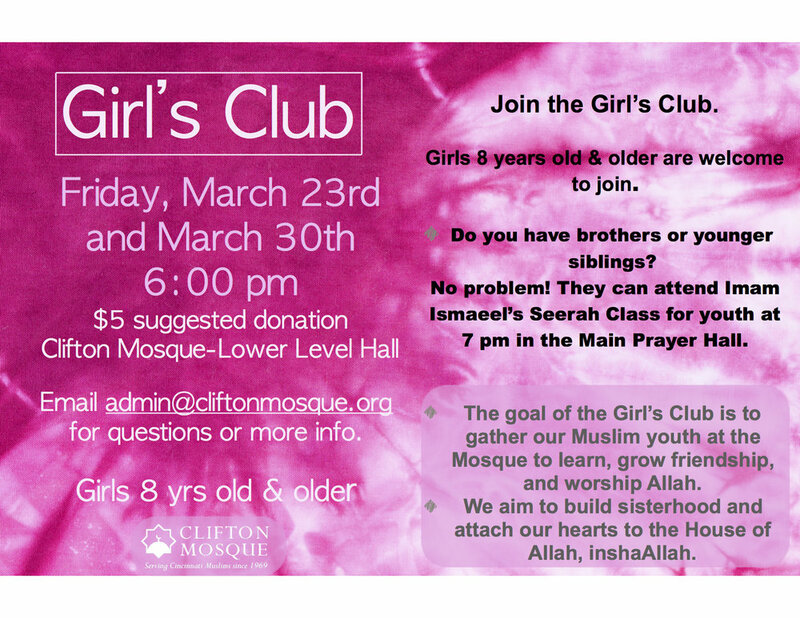 In March, the Girl's Club will be meeting on the 9th, 23rd and 30th InshaAllah at 6 PM. Children who are younger than 8 are not allowed at the Girl's Club. But, they are welcome to attend Imam Ismaeel's Seerah for Kids Class in the musalla at 7 pm. Moms are invited to stay during the club to help run activities. For more information, please email admin@cliftonmosque.org. There is a suggested donation of $5 at each club meeting.